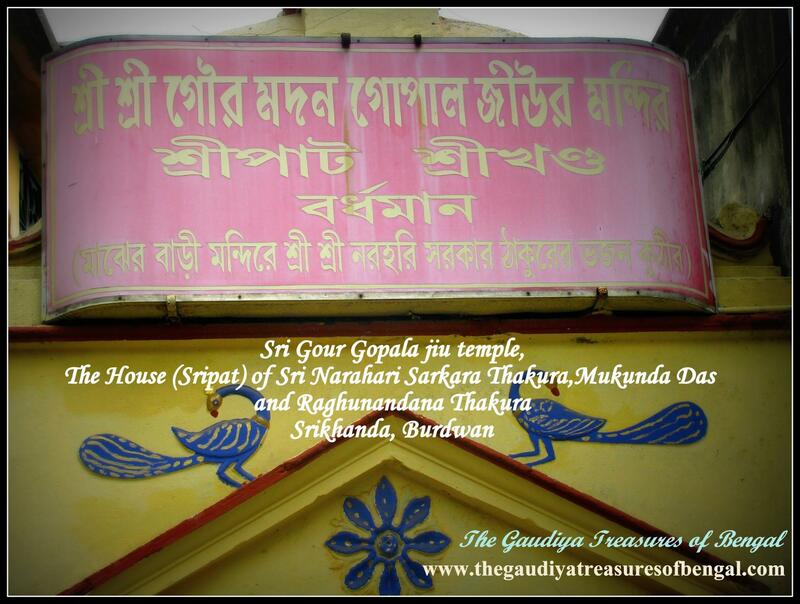 One of the sweetest spiritual sites that ‘The Gaudiya Treasures of Bengal’ has come across during its vast journey across Bengal is the maternal home of Sri Caitanya Mahaprabhu. 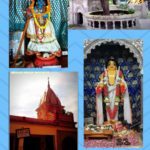 Located at a place called Belpukur within the precincts of Simantadvipa (one of the nine islands constituting Navadvipa) , this is where Sri Nilambar Chakravarti, Mahaprabhu’s maternal grandfather, used to reside along with his family 500 years ago.Sri Madana Gopala, the worshipable deity of Sri Nilambar, has been carefully preserved at this holy place and continues to accept our humble service till this day. The beautiful deities of Sri Nilambar Chakravarti and his daughter Srimati Saci devi is also worshipped over here.The temple priest ,Sri Nimai Krishna das Prabhuji, who lives and serves here, has been subsequently initiated into the Gaudiya Sampradaya by HH Jayapataka Swami Guru Maharaj. 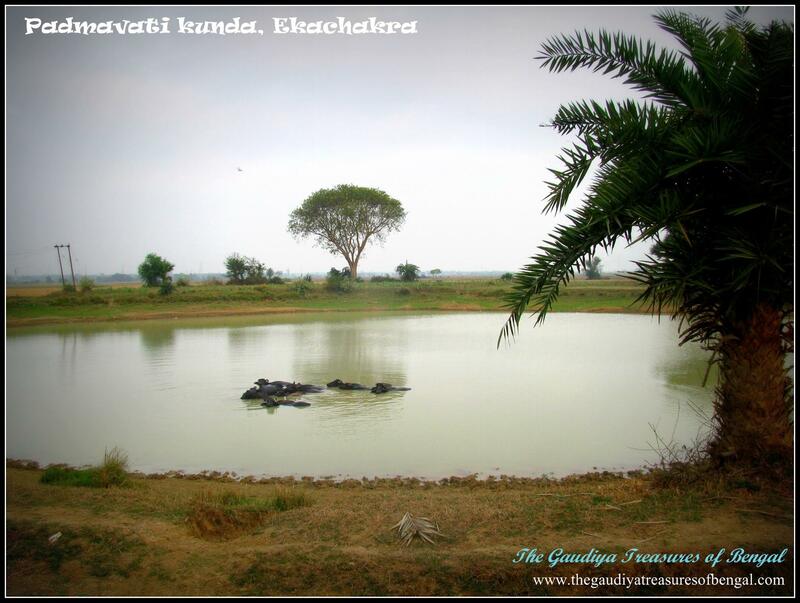 Being His maternal home, this place is very dear to Sri Gaurahari. Infact all of us have a very special place in our hearts towards our maternal homes, and the Supreme Lord ,being a person, is also no different.In fact, a lot of His balya lilas (childhood pastimes) have taken place here at Belpukur. 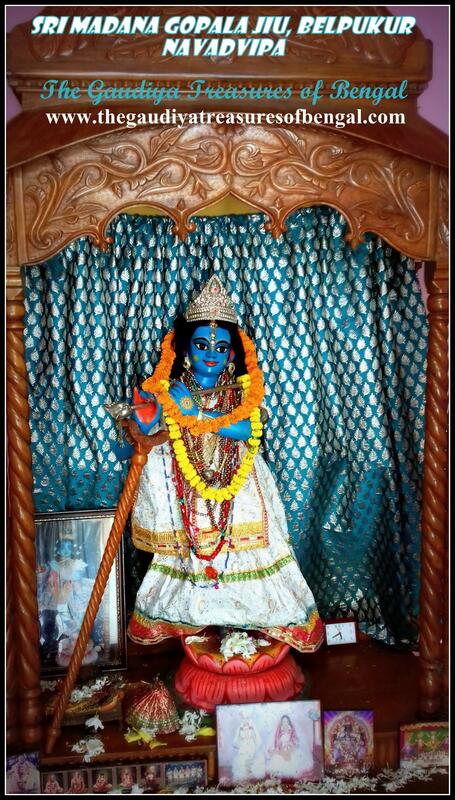 The dust of this holy place is thus sanctified with the lotus footprints of Little Nimai. Sri Birchandra Prabhu, or Birbhadra Goswami , as He was later referred to, was born on the ninth day of the dark fortnight, in the holy month of kartika (october-november). Birchandra Prabhu was the son of Sri Nityananda Prabhu and Vasudha devi. Srimati Jahnava mata was His initiating spiritual master. Sri Birchandra was an expansion of the Supreme Lord Himself, and appeared in this world to assist His father in furthering the mission of Lord Caitanya.Kavi karnapura reveals in his Gaura Ganoddesha Dipika that the expansion of sankarshan, who sleeps on the ocean of milk (Kshirodakashayi Vishnu) and manifests as the supersoul in our heart , had incarnated as Birchandra Prabhu in Mahaprabhu’s pastimes. The holy dham of Khardaha is located hardly at a distance of 20 kms from kolkata.The land of merciful Nityananda Prabhu is decorated all over with various wish fulfilling trees that readily bestow pure devotion upon all without any discrimination. Various demigods have been waiting and meditating for millions of years desiring to take birth in the transcendental abode of Khardaha, where they shall be able to associate with the Lord’s pure devotees and obtain the dust from their lotus feet.The land of Khardaha is a witness to Lord Nitai’s ecstatic pastimes, merely contemplating upon which ,one easily gains entry into the realm of transcendence.Srimati Jahnava Devi, Vasudha devi, Birchandra Prabhu have all manifested their sweet pastimes here and sanctified this holy tract of land. 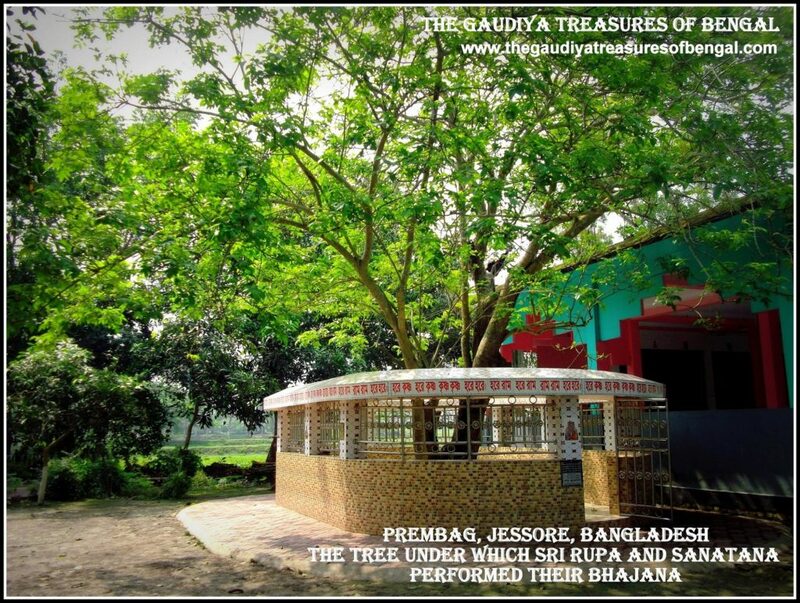 ‘The Gaudiya Treasures of Bengal’ is exceedingly blessed to have been able to visit Khardaha and take darsana of Radha Syamasundara jiu, who continues to shower His causeless mercy upon us suffering souls. Just a stone’s throw from the Syamasundara temple is the residence of Nityananda prabhu where Birchandra had appeared in this world.This house is renowned all over the three worlds as ‘Kunja Vatika’ and we have covered our visit to this place in a separate article entitled – ‘Kunja Vatika, Khardaha’. Lord Caitanya Mahaprabhu is the moon who had risen over the lands of Mayapur, a little over 500 years back,and by whose mercy, and empowerment, this awe-inspiring Krishna consciousness movement has now spread its aura over the entire world. 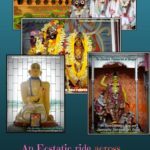 Hence it was only befitting that His commander in chief (senapati bhakta) , A.C. Bhaktivedanta Swami Prabhupada, the founder acharya of ISKCON, had named his headquarter of operations as ‘Sri Mayapur Chandrodaya temple’ (‘chandra’ means ‘moon’ and ‘udaya’ translates to ‘rising’ in bengali). The holy abode of Mayapur might appear to be just a remote village to one who sees things from a mundane perspective. 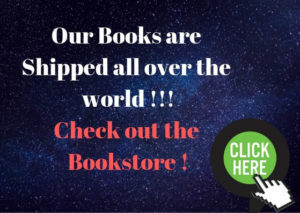 But to the esoteric ,well versed with the conclusions of the revealed scriptures, the land of Mayapur comes across as the very center of the spiritual world, the very highest realm of transcendence. 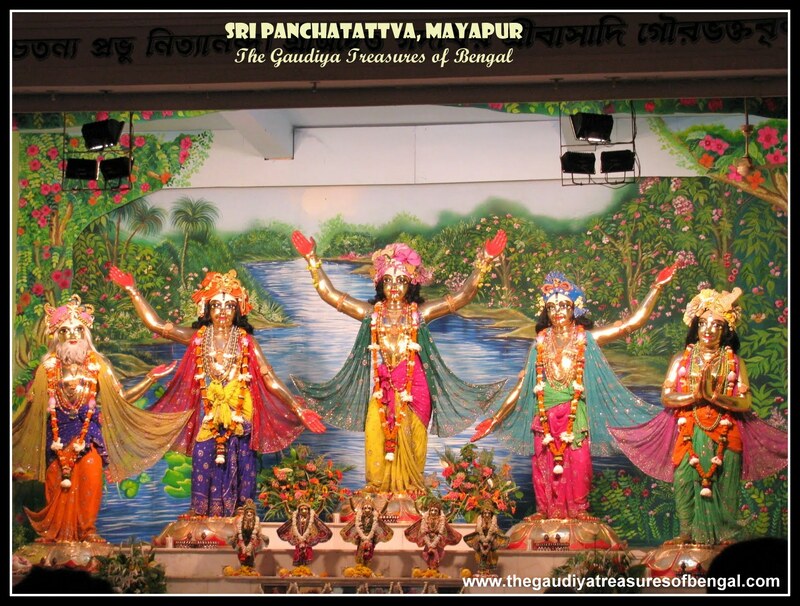 It was at Yogpeeth, situated a few hundred metres from the Mayapur Chandrodaya temple, that Sacinandana Gaurahari had appeared in this world in the year 1486 AD and began mercifully manifesting His ecstatic heart-melting pastimes (refer – ‘YogPeeth, Mayapur, Navadvipa – The birthplace of Sri Caitanya Mahaprabhu’). One who dearly worships ‘Nader Nimai’, and intensely hankers for His association, can till this day ,perceive the magnanimous Lord singing and dancing upon the streets of Navadvipa, enchanting one and all by His unique movements and unparalleled expressions.’The Gaudiya Treasures of Bengal’ can only stand back and stare at the very rare fortune of the residents of Navadvipa, to whom the dust of Gaurasundara’s lotus feet are so easily obtainable.Srila Prabhupada gave Mayapur to the entire world, by propagating the message of Sri Caitanya Mahaprabhu far and wide (refer –’The birthplace of A.C Bhaktivedanta Swami Prabhupada, Tollygunge’). It is by the mercy of Srila Prabhupada, that today his beloved children and grandchildren, can gain entrance into this eternal abode and relish the transcendental pastimes of Vishwambhara (the Lord of the Universe). I offer my obeisances unto the Supreme Lord, Sri Krishna, who is non-different from His features as a devotee (Lord Caitanya Mahaprabhu), devotional manifestation (Sri Nityananda Prabhu), devotional incarnation (Sri Advaita Acarya), devotional energy (Sri Gadadhara Pandita) and pure devotee (Sri Srivasa Pandita). 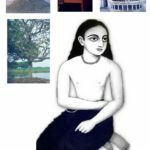 Lord Nityananda, is the incarnation of Lord Balarama ,and He had appeared here at Sri Ekachakra Dham, to assist Sri Caitanya Mahaprabhu, the Supreme Personality of Godhead, manifest the most magnanimous pastimes. 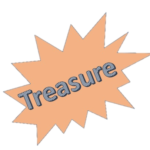 In the battle of Kurukshetra, Sri Krishna broke His pledge of not using any weapons,by picking up a wheel ,and charging towards Bhishma, who was then fighting valiantly against Arjuna. Bhishma was a great devotee of the Lord, and seeing the Lord charge at him, he threw away his weapons and fell down in surrenderance.He began singing Krishna’s glories, hearing which the Lord calmed down and threw away the wheel He had picked up.This wheel is said to have flown all the way from kurukshetra to land here at this small village in Bengal which came to be subsequently known as Ekachakra.’Eka’ means one and ‘Chakra’ translates to wheel in bengali.Lord Nityananda Prabhu’s subsequent appearance and His display of the most merciful pastimes here ,has identified this sacred land as the king of all pilgrimages.Sri Nityananda Prabhu is the manifestation of the Lord’s devotion (bhakta svarupa) and without His mercy, it is not possible for one to obtain the shelter of Lord Caitanya. Sri Nitai is our original Guru who helps us connect back with Krishna. 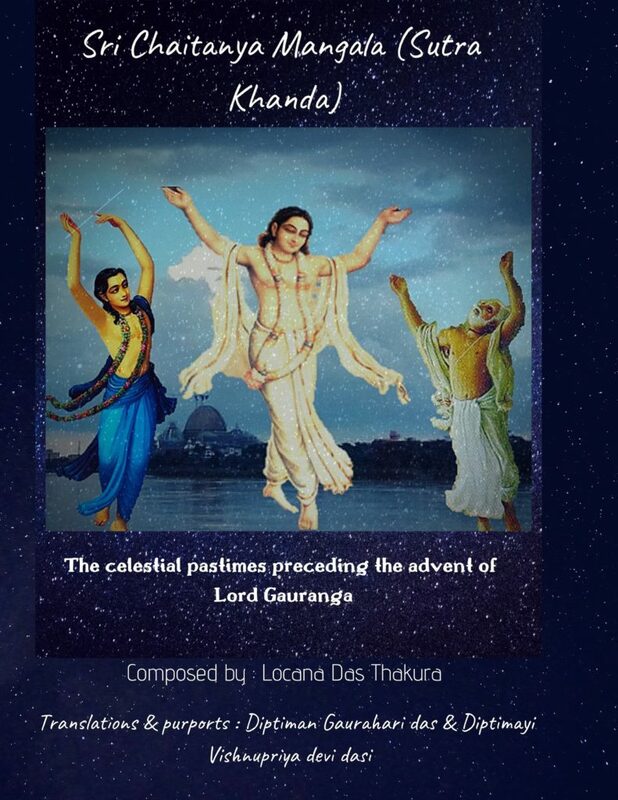 The spiritual master ,by whose mercy we cross over this vast ocean of material existence, is actually the representative of Lord Nitai.Narottama Das Thakura sings ‘Nitai pada kamala, koti candra sushitala, je chayay jagata juray’.In other words, he reveals, that the lotus feet of Lord Nityananda is more soothing than a millions of moons, the shelter of which encapsulates the entire world.’The Gaudiya Treasures of Bengal’ considers itself utterly unqualified to narrate the qualities or pastimes of our Doyal (merciful) Nitai, and hence begs His permission so that He mercifully empowers us to do so. 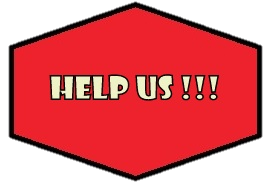 We consider our lives to be a success, being able to visit Sri Ekachakra dham and pray that she kindly accepts us as one of her dear servants. A few miles south of Katwa, on the bank of the holy Ganges, lies the beautiful town of Agradwip. The scenic beauty of this place is an absolute treat to the eyes. Our team from ‘The Gaudiya Treasures of Bengal’, took a boat ride from the ‘Agradwip ghat’ to cross over to the other side of the river,in order to reach the temple of our beloved Radha Gopinatha jiu. The blissful breeze of the holy river, the heart-rending shelter of the captivating tall trees and the melodious tunes of the chirping birds are a perfect setting for the devotees to surrender themselves to the calls of the divine, and forever escape into the realm of transcendence. 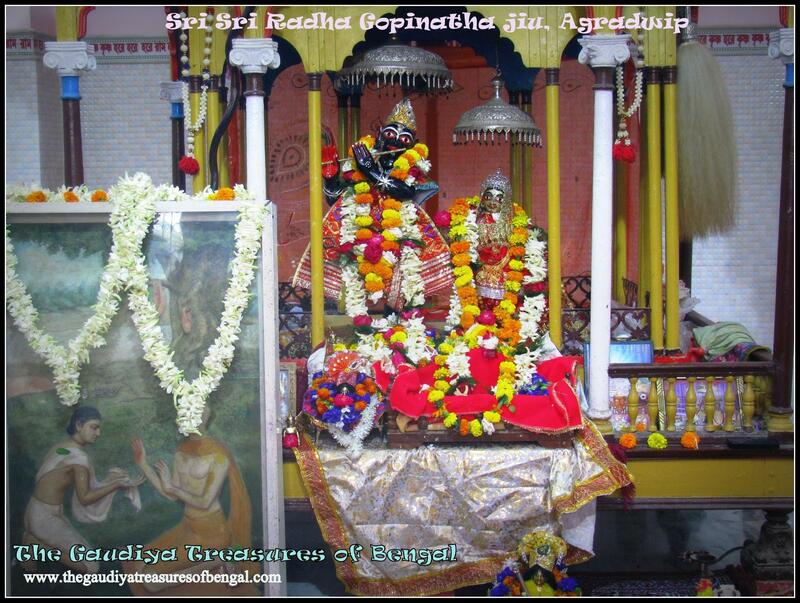 Sri Radha Gopinatha jiu is the worshipable deity of Sri Govinda Ghosh, an eternal associate of Sri Caitanya Mahaprabhu. For those who don’t know, Lord Caitanya, is none other than the Supreme personality of Godhead who had descended about 500 years ago, in the city of Navadvipa, to reclaim the fallen souls and inaugurate the congregational chanting of the holy names of the Lord (Please refer to the article – ‘YogPeeth, Mayapur, Navadvipa – The birthplace of Sri Caitanya Mahaprabhu’).The three brothers, Sri Govinda Ghosh, Vasu Ghosh and Madhava Ghosh assisted the Lord in performing His heart melting pastimes. Lord Caitanya, or Gauranga, as He is sometimes referred to, is worshipped as ‘Maha Vadanyaya’, or the most munificent incarnation of the Supreme Lord.This is because He gives freely what no one else, or no other incarnation of the Lord has given before- the pure ecstatic love of Krishna. 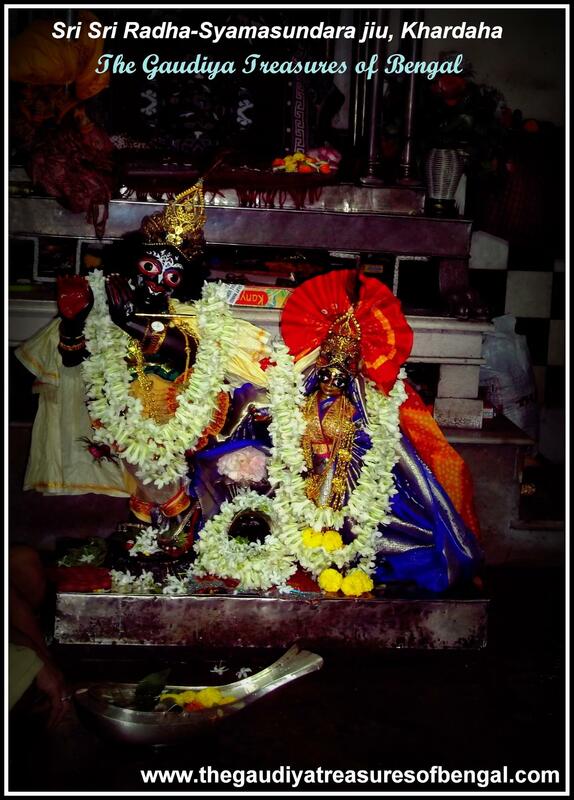 About 20 kms west of Katwa, on the banks of the Ajay river,lies a village named ‘Kulai’.It was in this village that the three stalwart vaishnavas, Sri Govinda Ghosh,Sri Madhava Ghosh and Sri Vasu ghosh had mercifully appeared, and as a result of which this place had become sanctified and renowned all over the three worlds. 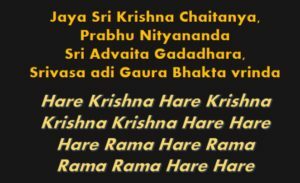 These three brothers possessed a very melodious voice and their songs provided a lot of delight to Lord Gauranga and Nityananda who danced at their tunes (Govinda Madhava Vasudeva teen bhai , Ya sabara kirtane nache Caitanya Nitai ). 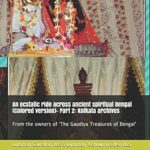 Before we begin this article, ‘The Gaudiya Treasures of Bengal’ would like to apprise the reader that Bishnupur or Bana Bishnupur (as it is sometimes referred) is arguably the very best pilgrimage, where one could still get a first hand experience of the great opulence and grandeur that once punctuated the Gaudiya tradition of erstwhile Bengal. 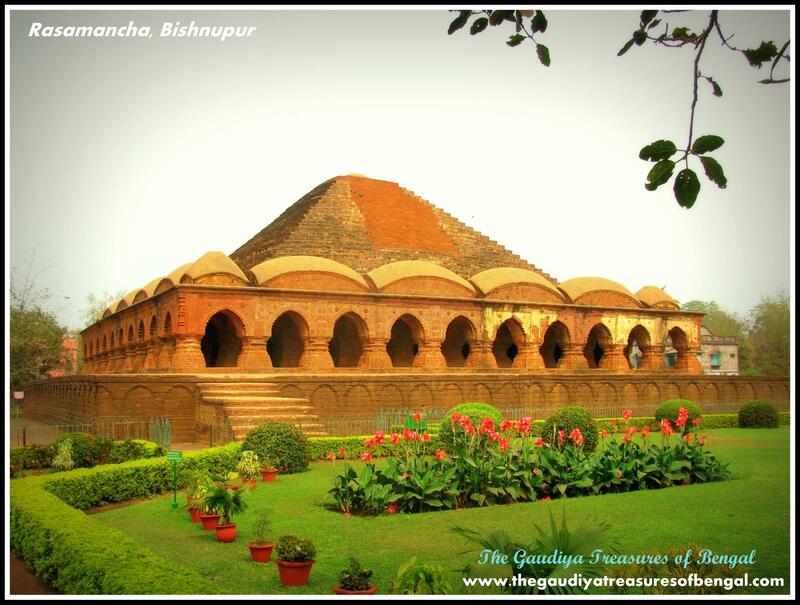 The whole town of Bishnupur, which was once the capital of the Malla kingdom, is adorned with magnificent temples, showcasing exquisite architecture, built with bricks and laterite stones, that still stand tall to tell a tale of a glorious heritage, that we people of Bengal should be exceedingly proud of. Bishnupur, the land of red soil, boasts of a rich culture that is second to none and is inhabited with such gentle dignified and well behaved people, who can indeed be compared to demigods. In a nutshell, Bishnupur has left a taste in us which we shall never forget in our life. The earliest records of the Malla Kingdom of Bengal dates back to 694 AD, when king Adi Malla ascended the throne. The land ruled by these Malla Kings was known as ‘Mallabhum’ and was mainly centered around the district of bankura,but also included parts of Burdwan,Medinipur,Murshidabad stretching as far as ChotaNagpur in Bihar. The capital of Mallabhum came to be later known as Bishnupur, named after Lord Vishnu, the supreme personality of Godhead and since Bir Hambir, the 49th Malla king ,took reins of the kingdom (around the year 1565 AD), Vaishnavism became the predominant cult in these lands.